BusinessWeek Articles: Cover Story on Glock & "Change by Design"
Pretty intriguing article in the Sept 21 issue of BusinessWeek on the handgun manufacturer Glock. I suppose it's not a shock given the industry it operates in, but as "Glock's Secret Path to Profits" details, lots of shady (but entertaining) things there. Contracted hits on the founder... tax-haven shell companies, good times all. On a very different note, there was an interesting piece in the Oct 5 BW issue from IDEO design shop founder Tim Brown. The book excerpt was taken from "Change by Design"... about how companies (such as Kaiser Permanente) can apply design thinking to internal and customer-facing processes. Just finished "Reset: How This Crisis Can Restore Our Values and Renew America" by Kurt Andersen and found it to be pretty good... not great, but pretty good. I first heard of Andersen as his his work of historical fiction "Heyday" was on the bestseller list and then later came across two excellent pieces he wrote for Time Magazine. The first was an Apr 2009 cover story "The End of Excess: Is This Crisis Good for America?" that I described in this blog post as "a compelling read that looks at America in each of the last few decades and how things led up to the economic collapse of the past six months." The second was an essay titled "The Avenging Amateur" Andersen wrote for an Aug 2009 issue issue of Time and which served as the basis or jumping off point for "Reset". I linked to the article in this blog post and truth be told... probably enjoyed this essay a bit more than the book Andersen wrote out of it in that it was more focused. That said, "Reset" is a mere 70 pages and an extremely quick and fairly interesting read. The amateur spirit referenced in both the Time article and book is a hearkening back to the founding fathers of America... who helped create the country while at the same time running farms and businesses. Some of the other points Andersen makes are around getting control of health care costs and oil dependency, while at the same time using the economic crisis as a trigger to both control spending and foster innovation. Good concepts all and more information on Andersen can be found on his website. The idea is for Time Magazine and its affiliated publications including Fortune, Money, Sports Illustrated to continually report on the once thriving city of Detroit. 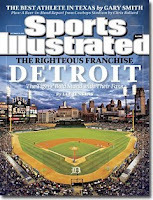 Both Sports Illustrated and Time had cover stories about Detroit this week and each issue featured pieces from the editor about why Time Inc. made this decision. Both that from Time Inc.’s Editor-in-Chief John Huey and the essay from Sports Illustrated’s Terry McDonell detail how far the city has fallen. The statistics referenced are 29% unemployment, 50% illiteracy and 70% unsolved murders… all from a place that used to be the epicenter of American manufacturing. 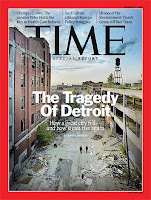 The Time Magazine cover piece is titled “Detroit: The Death — and Possible Life — of a Great City” and written by Daniel Okrent. It’s a broad overview of Detroit and it’s current struggles from someone who grew up there. Solid writing from Okrent, but probably more compelling to me was the Sports Illustrated cover story by Lee Jenkins. The frequent baseball writer contributes “Tigertown” about the team and efforts led by owner Mike Ilitch, to help revitalize the city. While the role a sports team can play in such a big task may seem insignificant, the franchise has worked hard to put a contending team on the field as well as make games affordable to its fans. An additional anecdote from the Jenkins piece showed the team’s support of local industry. When General Motors found itself unable to continue sponsoring the popular "home run water fountain", Ilitch decided to not seek different sponsor dollars. Instead, he simply added Chrysler and Ford alongside the GM name in centerfield... at no cost to any of the beleaguered automakers. Not a bottom-line based decision, but a very cool one. Two interesting short pieces from the Sept 28 issue of Time Magazine... both written by Joel Stein. The first is "Neil Patrick Harris: Emmy Host with the Most" and written about the former "Doogie Howser, M.D." star who has since developed a solid career as an adult actor. Just an interesting piece about a guy who seems very comfortable in his own skin. The second is Stein's last page column titled "To Vaccinate or Not To Vaccinate." It's a funny piece subtitled "My wife thinks I want to inject our infant son with cancer-causing toxins. So that's going well." There's a good chance that the essay appealed to me because his approach of getting all vaccinations, but on a delayed basis, is exactly what we've done with our son. Ahhh... validation, sweet validation. Just finished reading "Home Ice" by Jack Falla and... found it a good book. I've previously read two of Falla's books... his fictional hockey story "Saved" (which I reviewed here) and "Open Ice" (which I reviewed here). I enjoyed this book just completed, but probably liked "Open Ice" more as it featured a wider range of hockey writing by Falla (in addition to the really interesting material from "Home Ice" around his backyard hockey rink). To the point of his rink, I believe this story on how to build one is how I first came across the author. "I think it was now-retired Boston Globe columnist Tim Horgan who said "to be a sportswriter, it is necessary to love the writing as much as the sport." Like most writers I love the 'having written' a lot more than I love the writing. 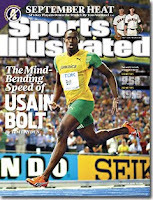 But I've already regarded sportswriting as worth and fulfilling in itself and not a synthetic substitute for playing. When I feel like playing I go out on my rink and play." Just seemed like a really good guy (as this Facebook memorial page seems to indicate) and such a shame for him to have passed away last year at the young age of 62. For anyone who loves hockey and good writing about it... I highly recommend "Open Ice" and then perhaps the other Falla books. Some good stuff in the latest issue of Time Magazine. In his "In the Arena" column, Joe Klein wrote "Obama's Appeal: A Test of National Character" about the effort at health-care reform... and how interesting it will now be to see what public opinion does. Basically, it's a question of whether (A) reasoned debate or (B) doing whatever it takes to not let the other guy win will rule the day. - "Jennifer's Body" opening Sept 18. No, it doesn't look amazing, but it's written by Diablo Cody. - "Where the Wild Things Are" live-action film of Maurice Sendak's book. Opens Oct 16. - "Eating Animals" by novelist Jonathan Safran Foer. A non-fiction look at the practice of vegetarianism. Releases Nov 2. - Andre Agassi's biography "Open". Releases Nov 9. - "New Moon"... the second "Twilight" movie adaption. Opens Nov 20. Excellent story in the latest issue of Sports Illustrated on a team that experienced tragedy and has spent the season figuring out how to cope and move forward. The Lee Jenkins piece "Touched By An Angel" looks at the LA Angels' season that began with such tragedy when Nick Adenhart was killed by an allegedly drunk driver in Southern California. The crash also took the lives of two Adenhart friends and as Jenkins details... left a third close to death and needing extraordinary efforts from doctors to help avoid paralysis. I've posted links to stories by Jenkins a few times with the most recent story being his piece on Mark Buehrle's Perfect Game and find him to be a really solid writer. The Adenhart story is compelling stuff and paints a vivid picture of what the Angels have had to go through to reach their current point of what will be a playoff season. Excellent content from the Sept 14 BusinessWeek on the "Best Places to Launch a Career". The annual special report gets into a lot of interesting concepts that companies can offer new hires... especially in the area of opportunities for growth and employee value to the corporation. PC vs Mac & Windows 7 vs a slide rule: In it's Sept 7 issue, BusinessWeek technology columnist Stephen Wildstrom wrote "Snow Leopard: An Upgrade in Camouflage" about new the Mac operating system from Apple. In the vein of "equal coverage to both sides"... from the Sept 14 issue, Peter Burrows wrote "Will Windows 7 Reboot PC Sales?" and Wildstrom penned "Windows 7: Upgrading Can Be Hard to Do". Releasing Oct 22, Win 7 replaces the much reviled Windows Vista and it will be interesting to see both how Microsoft prices it and how good it is. Books of Interest: Two mentions of interesting books in the last few issues of BW. "Acting the Part of a Leader" is excerpted from "The Essential Bennis" by... Warren Bennis. Probably of more interest to me is "Borrowing Brillance" by David Kord Murray... and reviewed here. The idea behind Murray's book is that great business ideas frequently come from cherry picking other ideas and simply adapting them. Two excellent pieces on Ted Kennedy and his passing from the Sept 7 issue of Time Magazine. The first is "Ted Kennedy, 1932-2009: The Brother Who Mattered Most" by Richard Lacayo and the second "Ted Kennedy: Bringing the Myth Down to Earth" from David Von Drehele. I particularly enjoyed the Von Drehele piece as he's an excellent writer and the author of the non-fiction work "Triangle" about the Triange Shirtwaist Company fire of 1911 (which I reviewed here). Both Von Drehle's and the piece by Lacayo examine the legacy of the Kennedy brothers and how Ted fits in. He's the least mythologized as a result of his long life, but perhaps the most impactful over his political career... with the youngest brother's Presidential ambitions having led into his highly successful run in the Senate. "Ted might have gone early. In 1964 he was dragged, critically injured, from the wreckage of a plane crash. Had he died that day, he too would have remained forever young and dashing. No Chappaquiddick, no divorce, no boozy indiscretions. But also no antiapartheid campaign, no Americans with Disabilities Act, no Family and Medical Leave Act." Such a shame for him to pass away now before one of his battles... that for universal health coverage, could be realized (with his passing also taking away a perhaps needed vote in the Senate). On a different topic from the same issue, I also found interesting the Nancy Gibbs essay "Cash for Clunkers: The Bribery Stimulus" which details the enormous public response to a program that may not do much other than get people excited about a deal. As Gibbs writes about... if that gets people excited and optimistic about the economy, it's $3B well spent. Having really enjoyed "Angela's Ashes" by Frank McCourt, I decided to read his follow-up memoir "'Tis" and found it... ok. In my review of "Angela's Ashes" I wrote of it's dual elements of an interesting story and descriptive language and unfortunately, didn't really find "'Tis" to have either of these things. I often felt like I was simply reading a journal of "then I did this, after that I did that" and none of it was terribly interesting. McCourt's chronicle of his years as first a a newly arrived immigrant in New York and then a teacher, husband, father and sometimes caretaker of his mother at times seemed like a series of lists. It may not have occurred to me had I not seen criticism of McCourt as a son in this Richard Harris interview, but I didn't find McCourt's actions and attitudes towards both his wife and mother to be that endearing. It's hard to form a well-versed opinion on simply what was written in "'Tis", but frankly, I felt bad about his mother's time in New York after the struggle she went through keeping McCourt and his siblings fed when they grew up poor in Limerick, Ireland. Probably not going to read the third McCourt memoir, "Teacher Man". Very cool piece from the latest issue of Sports Illustrated. 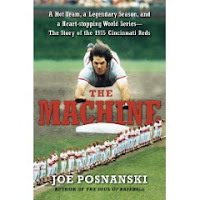 Titled "Welcome to the Machine", it's an excerpt from the upcoming Joe Posnanski book "The Machine: A Hot Team, a Legendary Season, and a Heart-stopping World Series: The Story of the 1975 Cincinnati Reds".